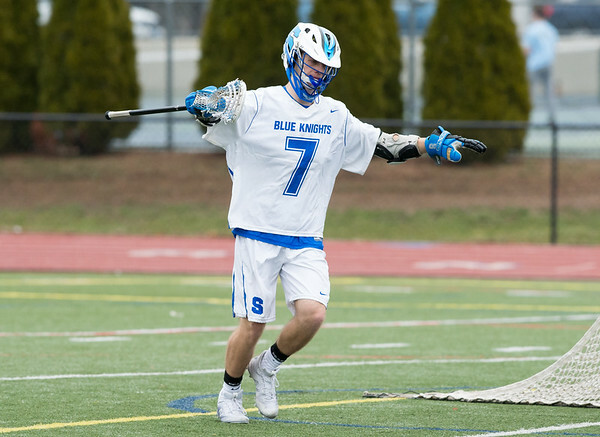 SOUTHINGTON - For Southington senior attacker Evan Johanns, the fourth time proved to be the charm. Battling through cold weather and an inefficient shooting night, Johanns missed three straight shots on a key Southington man advantage in Monday’s boys lacrosse game against Newington. Clinging to a one goal lead in the fourth quarter, Johanns and the Blue Knights were desperately looking for separation, but Johanns kept coming up empty. Then his fourth try found the back of the net, and the goals came in bunches immediately after. Johanns’ first goal of the fourth sparked a stretch of three straight in the decisive fourth quarter to give the Blue Knights a 13-9 win. Johanns, who finished with eight goals on the night, now has 17 through his first three games, though he believes he would have had a lot less had that one goal in the fourth not snuck in. Newington (2-2) battled through the second half, erasing a three-goal deficit and tying the game four different times, three of which came in the third quarter, but was never able to take the lead. Newington came out of the second half trailing by three, but two goals by Petrichello and one by Matthew Bradley tied the game less than five minutes into the quarter. That depth was depleted late in the first half when midfielder Mike Zapatka left the game with a concussion, and would not return. Still, without their sophomore midfielder, the Indians continued to fight and carried a tie game into the fourth quarter, when senior midfielder Eli Steindl put home a circus goal for the Blue Knights (2-1), falling to the turf as he fired a shot past Newington goaltender Sam Davies. Southington originally held a 3-1 lead after a goal by Jack Tedone, but a pair of Newington goals by Matthew Bradley, the latter coming with less than 30 seconds remaining in the first quarter pulled the Indians to within 4-3. Looking for separation, the Blue Knights opened the second quarter with two straight goals in the first two minutes, one on a breakaway from Johanns, and another on a pretty move from Matt Thompson, who faked a pass before ripping home the team’s sixth goal, which gave Southington its largest lead of the game. That lead evaporated by the end of the third, but the Blue Knights held tough on its home turf to notch its 11th win over the Indians since 2007. They closed the door thanks to Johanns, who put in his second goal of the fourth with 5:16 left on another man advantage, ringing a shot off the post and in to match the Blue Knight’s largest lead of the game at 12-9. Johanns still wasn’t done. The senior sent in the exclamation point on a game-changing fourth quarter with a missile of a goal with less than two minutes left to go ahead 13-9 and put the game out of reach for the Indians, who flirted with their first win against the Blue Knights in over a decade. Posted in New Britain Herald, Newington, Southington on Monday, 8 April 2019 21:07. Updated: Monday, 8 April 2019 21:10.